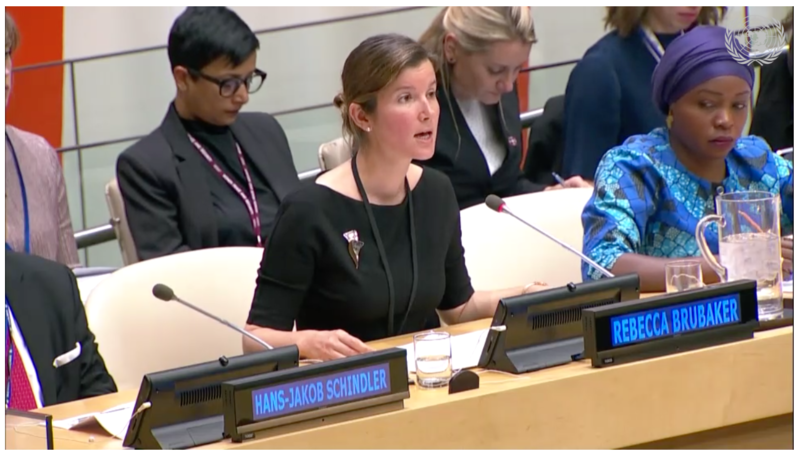 The UN Security Council Arria Formula Meeting on The Use of Sanctions in Addressing Sexual Violence in Conflict took place on 22 October 2018. The Arria meeting was co-hosted by the missions of the Kingdom of the Netherlands, Côte d’Ivoire, France and Peru. Dr Rebecca Brubaker briefed the meeting with the following statement. In the decade since this Council passed resolution 1820 – the Council’s willingness and ability to design and implement sanctions, aimed at deterring humanitarian and human rights abuses in conflict, have grown. Drawing on a review of current research, I have been asked to address three questions: First, what do we know about what works in designing and implementing UN sanctions? Second, how can these lessons be applied to the issue of country- and conflict-specific sanctions regimes? And finally, what recommendations can be made for a way forward? Analysing past practice shows us that effective sanctions can deter violations of international law in three main ways: coercion, constraint, and signalling. For this particular issue – sexual violence in conflict – signalling, or what some might call stigmatization, is often the Council’s only recourse when perpetrators and their commanders do not travel internationally or do not use bank accounts but do care for their reputations and the associated knock-on effects of being on a UN sanctions list. So to consider stigmatization in UN sanctions regimes, three key factors can be identified: clarity, timeliness, and credibility. On clarity, there is strong evidence that, to be effective, the Council’s warnings must be clearly articulated, conveyed, and understood by the target. On timeliness, the Council’s message to targets is most effective when it comes immediately following credible reporting of systematic violations. The longer the delay, the less effective the response. On credibility, it is not enough to establish a relevant mandate or new designation criteria. To effectively combat a culture of impunity, the Council needs to be seen to act on its warnings. Taken together, these three elements provide a useful outline for when signalling, in general, tends to be most effective. But what does this mean for sanctions designed to combat conflict-based sexual violence, in particular? The Security Council and its Sanctions Committees have already taken a number of effective steps to apply sanctions to combat sexual violence. Almost all of its conflict-based sanctions regimes already possess designation criteria that would enable its Committees to sanction perpetrators, in line with resolutions 1820, 1888, 1960, 2106 and 2242. Moreover, over the last ten years, the Council has broadened the scope of those protected and those targeted by these provisions. This Council’s more recent decision to establish “stand-alone designation criteria” focused on sexual violence in both the CAR and the South Sudan sanctions regimes provides an excellent example of clarity and, to a certain degree, timeliness. But what of the proposed country-specific, single designation regime focused on sexual violence in conflict? The evidence suggests it would increase the clarity of the message to targets and, thereby, contribute to deterrence. But it would only increase timeliness and credibility, if its establishment were followed by regular designations. First, to continue to ensure that designation criteria specific to sexual violence are included in each new conflict-related sanctions regime. Not only will this provide the basis for action, but it will unequivocally signal to the world the Council’s willingness to shine a consistent light on this issue. Second, the credibility and impact of future sanctions listings will be greatly bolstered if Panels of Sanctions Experts draw directly on the experiences of survivors and what the Nobel committee has called the “helpers” and “witnesses” of sexual and gender-based crimes. To facilitate the gathering of evidence, Panels of Experts need to have access to affected regions and affected individuals. But in order to do this, panels first need to possess the appropriate expertise, sufficient capacity, and predictable financing to fulfil this part of their mandate. Third, to work to synchronize the efforts of the Secretary-General and the relevant sanctions committees in deterring and combatting impunity. Both the clarity and credibility of the message as understood by the target, can be impacted when the Secretary General’s list and the sanctions lists contain different names in regions covered by UN sanctions. When used strategically together, however, these mechanisms can reinforce each other. Finally, this Council and its committees have yet to designate any individual or group for sanctions solely on the basis of these acts. Instead, sexual violence is often tacked on to other reasons for listing, including non-compliance with a peace agreement or links with terrorist groups. While this is often a practical necessity, to increase political support for a proposed listing, it also sends the clear message that sexual violence alone is not bad enough to warrant UN sanctions. Designating solely on the basis of conflict based sexual violence would send a clear message that the Council is determined to end impunity for these acts.